The City of Chicago Department of Water Management North District dispatched an Investigator Crew last night. The crew called in the emergency and the person-in-charge did not authorize a crew to respond to the major emergency. After a three day weekend overtime feast consisting of time and one half, double time, and triple time, a choice was apparently made to not respond to this major emergency in a timely manner. I hope someone from the Mayor’s office reviews the time from the first 311 and or 911 call was made, until this 36 inch feeder main was shut down. I also want to know if personnel from the Central district was dispatched due to incompetence in the North District. I want to know when the Emergency Shoring was dispatched to the job. It was not. I want to know who let this get this far out of hand. I ask you, if Patrick McDonough was making repairs to 48 inch water mains all by himself, why does this water main repair require, the Fire Department, including a Command Center, the Gas Company,, the Electric Company, Streets and Sanitation Crews, Tow Trucks, The Sewer Department, Orange peels, vactors, Semi Trucks, Layers of Politicians, (I mean Water Department Management), Chicago Police, Traffic Aides, to name a part of the support staff. Bottom line, Incompetence cost money every time. According to Newspaper reports, the Department of Water Management has a monitoring system to avoid these breaks. These non-union companies are a scam deluxe and wasted money. They hire kids and workers that sleep while on the public dime. Who is getting a piece of that deal Boyz? The Chicago Inspector General is useless to regulate anything, so just pay more in taxes Chicago! The Montrose and Walcott water main break damage should have been avoided. Photo by Patrick McDonough. A North Side water main break has been controlled Tuesday morning, but police still have a large area in the North Center neighborhood closed to traffic and pedestrians while the structural integrity of the streets and sidewalks are examined. Police were notified of a water main break in the 1900 block of West Montrose Avenue about 12:30 a.m., police News Affairs Officer Amina Greer said. The leak was controlled about 6:45 a.m., Department of Water Management spokesman Tom LaPorte said. A North Side water main break in the 1900 block of West Montrose Avenue cause buses, train disruption Tuesday. Police have set up a perimeter between Sunnyside and Berteau avenues and Lincoln and Ravenswood avenues, LaPorte said. Residents are being allowed to leave the perimeter, but no people or traffic are being allowed back in until the structural integrity of the roads and sidewalks can be examined. The CTA Brown Line station at Ravenswood was temporarily closed, but after officials determined the station did not suffer any structural damage the station was reopened. As of 7 a.m., passengers must enter from the east, LaPorte said. 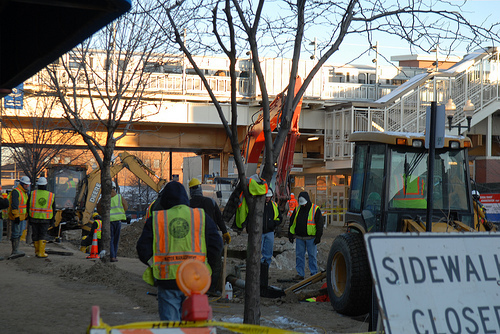 The street collapse has also caused the CTA to reroute the No. 78 Montrose bus. Eastbound buses are being diverted at Damen Avenue, then head to Lawrence Avenue, until they get to Western Avenue, at which point they will head back to Montrose. Westbound buses are being rerouted at Western Avenue to Lawrence, then heading to Damen, back to Montrose and their regular route. At the request of the Chicago Fire Department, ComEd has shut off power to one building in the area, at 4420 N. Seeley Ave., according to ComEd spokesman Tom Stevens. The Department of Water Management believes a 36-inch cast-iron feeder-main — believed to be about 80 years old — is responsible for the flooding. The broken main caused the street to collapse near Montrose Avenue and Honore Street, leaving a 25-foot hole, LaPorte said. “There was a lot of water, which may have undermined the soil beneath the street,” LaPorte said. The cause of the break was not immediately known. No timetable has been set for the completion of repairs and it is not known when the streets will be reopened. Hickey and the boys get many pick sheets, but they deserve it. You will not see all the support the politicians (Caulkers) Mr. T and Alderman Banks have running the crews. How about the Caulker that was a Deli Manager at Jewel? The North District is all political. Just ask Wally the loafer. Central District keeps downtown humming smooth as silk. Tom Laporte told everyone before there are investigations into the Lincoln Park Water Main Break. They were going to inspect the cause. That pipe was hidden in the Wabansia Yard and than scrapped for cash, Who got that money? We do not forget anything at Chicago Clout. Barrett Murphy is a former cop. Why is he ordering Plumbers around. No work was done today. Nothing. Thank God Caulker Mikey Dwyer in Truck 911 was there to take command. No Work- Just Paperwork. Looks like the circus is back in town.And sponge is the ring leader.McDoungh is the guy with the camera,who crys all the time about city coruption,but yet lives in Desplaines and works for the city.He also claims there is no shoring on this job.Did they let you get close enough to prove that?How do you have so much time to take these pictures but yet still claim to work?Or do you just watch Benny Hill videos at the garage? And, of course, the whore media paint this as the city working night and day to fix this. No mention of the most basic neglect and mismanagement that is the cause of this. No mention of the insanity of the city’s ‘leaders’ touting the spending of billions, OF TAX DOLLARS YET TO BE IMPOSED, on trying to get the 2016 Olympics, while our fundamental infrastructures decay and rot. No mention of the private contractors responsible for inspecting these infrastructures and, thus, anticipating, and preventing, such occurrences as this one, or who chose said contractors, who oversees said contractors and who is responsible for ensuring that the inspection work paid for is actually being done, and being done competently. Instead, we get short, meaningless promotion of the ‘heroic’ efforts being made, after the fact, to ‘fix’ the problem AND our city officials assuring us that this kind of thing will happen again. Makes me feel all warm and fuzzy, that I can count on my city government officials to let me know how impotent they are. But they sure know how to efficiently impose taxes.